EPS has been leading a team of consultants to assist the University of California Hasting School of Law (UC Hastings) in its planning and implementation of the redevelopment of a substantial portion of its San Francisco campus into a Multi-Disciplinary Academic Village. The program will incorporate the development of two new buildings, and the renovation of an historic 1920’s era tower to provide student housing for law students from UC Hastings, graduate students from UCSF, and potentially other academic institutions. 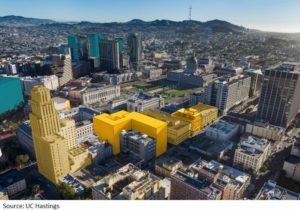 In addition to housing, the Academic village will offer office and support space, as well as recreational and wellness activities available not only to students and faculty but the surrounding Tenderloin/Civic Center neighborhood. This vibrant new campus will facilitate cross-disciplinary programs combining law, medicine, and other fields in new and innovative ways. The RFQ for a master developer was released at the end of February, and is receiving an enthusiastic response from the development community.